The School campus is located in scenic Northern Georgia, right in the middle of the Blue Ridge and Smokey Mountains. This beautiful and peaceful location affords our students an opportunity to take a break from their hectic lives and focus themselves entirely on learning, fellowship, and having fun. 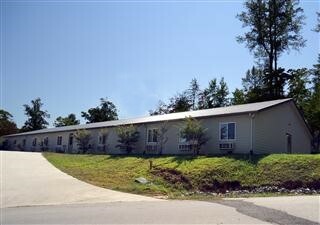 All of our lodge facilities offer fully furnished rooms with private baths and individual A/C units. All student rooms contain one full-size and one twin bed and Wi-Fi internet connection. Each lodge provides a communal lounge area where students can congregate and enjoy watching TV, reading, or just exchanging ideas. For more information on services provided by William Holland see our Policies and Guidelines. 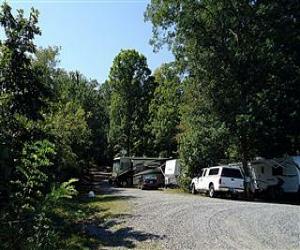 Our campground consists of eleven campsites made to accommodate everything from tent camping to 50 foot motor homes and offers a wonderful way to experience the beautiful natural setting of our campus and still be only a few feet from the classes. 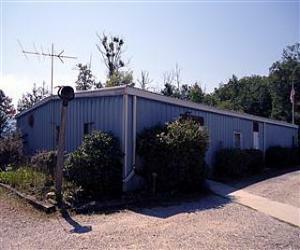 In 2002, Mary Lou's Cottage was added to accommodate our instructors. Located adjacent to Sparks Lodge, Mary Lou's offers 8 bedrooms, a spacious lounge area, a kitchenette and laundry facilities. Directly across from Sparks Lodge, the Seabolt building offers three additional classrooms, including our Lampwork studio. It also houses the George Kasper Memorial Library and offers support facilities for our campground including restroom facilities and showers. Completed in the spring of 1986, Sparks Lodge continues to serve as the centerpiece of our campus. The upper floor is devoted to lodging; offering twenty-nine bedrooms. The lower level contains thirteen classrooms as well as our offices, dining, and kitchen facilities. 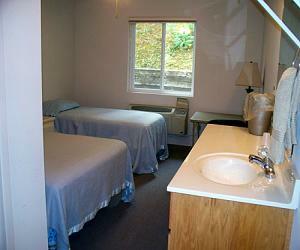 Sparks Lodge is a fully handicap accessible facility. 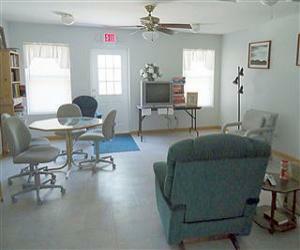 Both floors are accessible from ground level and access between floors is provided via a convenient elevator. The porch, which encircles the second floor, provides a perfect spot to sit and relax with other students and to enjoy the natural beauty of the North Georgia mountains.